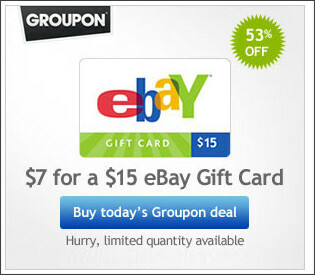 Groupon: $15 eBay Gift Card for only $7! I love this Groupon deal today! For only 7 bucks you can get a $15 eBay Gift Card! You need to have an eBay account & a PayPal account in order to use this. April Fool's Day: These Receipts Are Too Funny! FREEBIE: Orville Redenbacher's New Pop Up Bowl! INSTANT WIN GAME: Win Free Pemmican Beef Jerky! Harris Teeter: My Favorite Deals This Week.